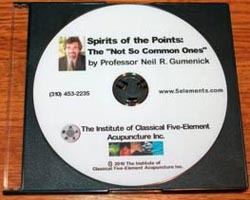 "The Not So Common Ones"
In this DVD, from The Five Element Acupuncture Symposium 2010 Continuing the Journey™, Neil teaches how to plan a treatment, incorporating points for their deep spiritual meanings, as well as the meanings and uses of many specific points, powerful, but often overlooked or misunderstood. This DVD is appropriate for practitioners of any style of practice. For information on ordering this DVD or Audio CD by phone, please call 310-453-2235.